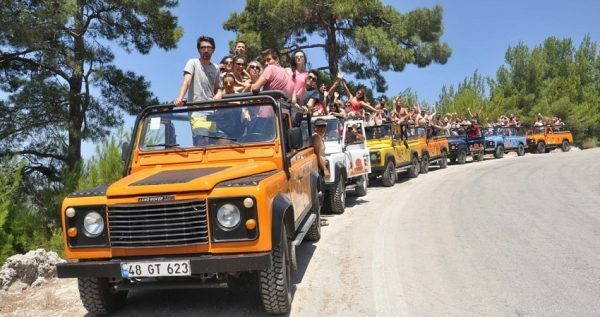 Explore Selcuk like never before with an adventurous, exciting and fun Jeep Safari excursion. 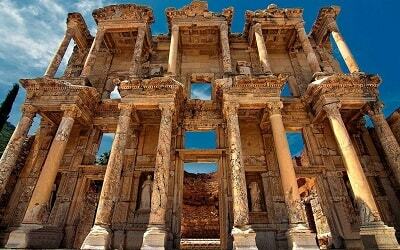 With this amazing excursion you will explore beautiful landscapes and visit small Turkish villages. Adrenaline boosts should be taken for granted as the Jeep Safari goes off road in dusty and wet tracks. This Selcuk Jeep Safari excursion will be a long lasting memory from your holidays. Jeep Safari starts during the morning. 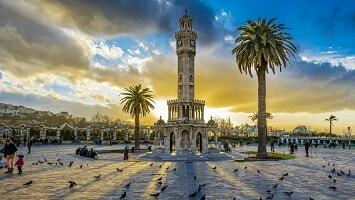 At a scheduled time, we will pick you up from your hotel in Selcuk. Get ready for an amazing experience as your off-road exploration starts. The 4×4 Jeeps are ideal for such activity, as they are able to pass through the hardest paths. The vehicles meet all the safety requirements and are fully insured. Each car can accommodate up to 10 people. The adventure continues off-road as you will be passing through some mountain trails. Dusty, wet and muddy off-road trails are what you should expect. The landscape will impress you are you will be passing through natural obstacles and many other natural settings. Get ready for some water fights between the cars. During your Jeep Safari exploration, the vehicles will also be passing through some picturesque small Turkish villages. These villages will impress you as you will be able to observe the authentic countryside lifestyle. A small tea break will be given at the Yenikoy village. There, you will get the chance to relax and enjoy a traditional Turkish tea. It is also a great opportunity to take some photos of the village. Selcuk Jeep Safari continues with a lunch break at a traditional local restaurant. The meal is a fixed menu that includes barbequed chicken, rise and salad. It has to be noted that, drinks come at an extra cost. Right after you lunch break, you will enjoy a 45 minutes addition break at the Pamucak Beach. 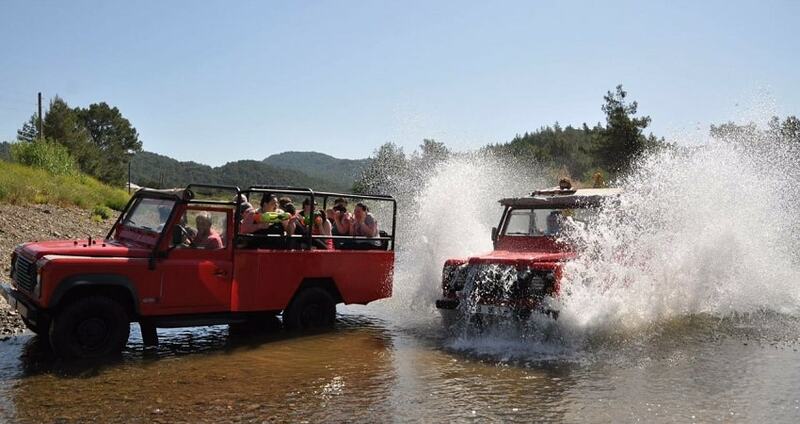 A revitalize swimming will be ideal after the Jeep Safari exploration. The beach is not crowded as it has few hotels at the one side. The location is ideal to relax in a beautiful natural setting after an off-road adventure. Once the swimming break is over, the Jeeps continue on their way back to Selcuk. An interesting highlight of this excursion is that guests can rent water guns and participate in a water fight between them and between the jeeps. Your ride will be an extraordinary off-road experience full of laughter. 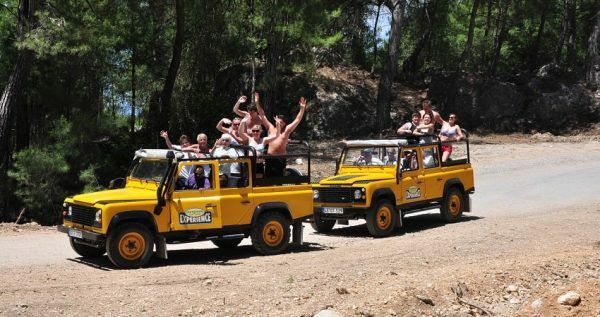 Selcuk Jeep Safari ends by the moment you arrive back at your hotel full of adrenaline and emotions. This excursion will be something special to remember from your holidays. Add some excitement into your holidays and explore Kusadasi with a Jeep Safari excursion. This tour offers some major adrenaline boosts as you will enjoy a memorable off-road driving through a forest. 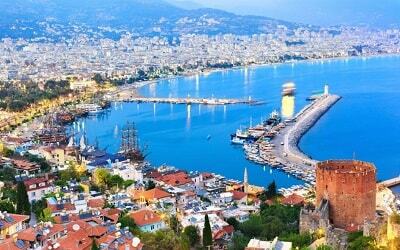 Discover the beauty of the Turkish countryside by vising small villages and enjoy swimming at a quiet beach. 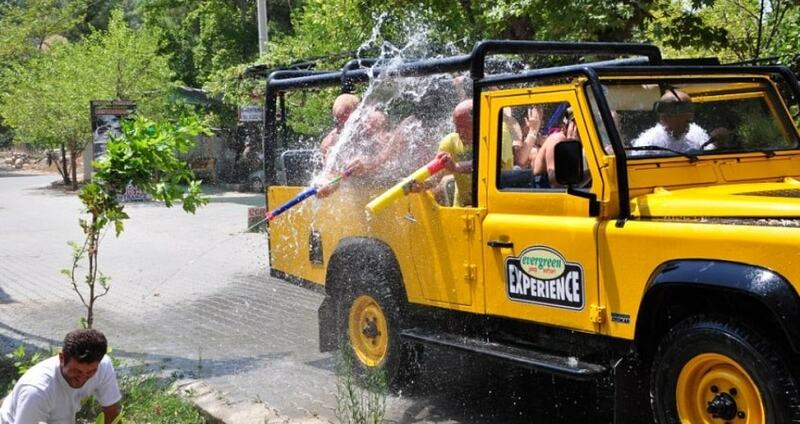 Selcuk Jeep Safari combines all in one and includes also a fun water fighting during the off-road experience. 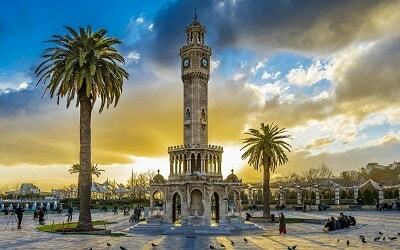 Depending on the scheduled time, we will pick you up from your hotel in Selcuk. That is the moment when this adventurous experience starts! The 4×4 Jeeps that are used in this excursion are ideal for such activity, as they are able to pass through the hardest paths. The vehicles meet all the safety requirements and are fully insured. Each car can accommodate up to 10 people. 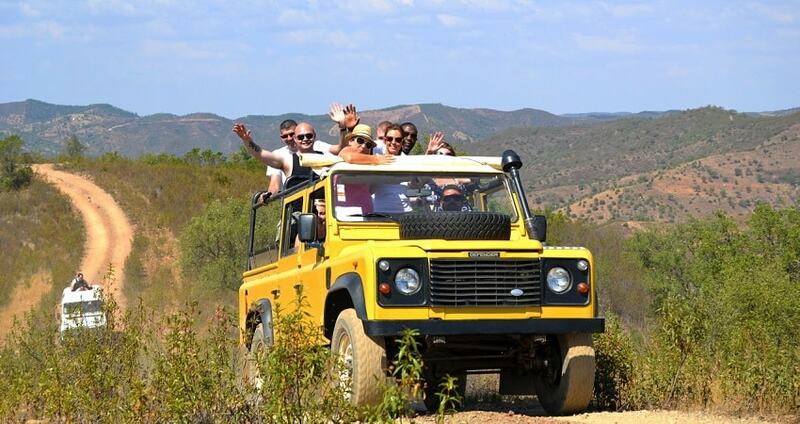 The excursion includes some exciting and adrenaline boosting off-road trails. During that part of the excursion, you will be passing through a forest with several natural obstacles. In addition, get ready for some water fighting between the Jeeps as you will be passing through dusty, wet and muddy roads. 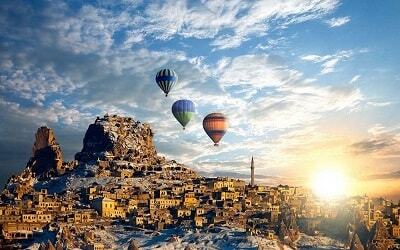 During your exploration, you will be passing through some small Turkish villages. That is the ideal opportunity to observe the authentic lifestyle and the hidden charm of the Turkish countryside. 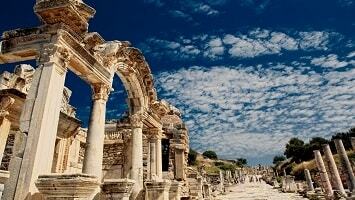 A small break will take place at a village called Yenikoy. There, you will be able to enjoy a traditional Turkish tea and relax for a while. Your Jeep Safari exploration continues with a lunch break. The meal will be served at a traditional local Turkish restaurant and the fixed menu includes barbequed chicken, rise and salad. It is important to mention that drinks are not included in the price. Energized and relaxed, you will then enjoy an additional break of 45 minutes at the Pamucak Beack. The location is ideal as the beach is not crowded. There, you can simply relax and enjoy the quiet atmosphere. Alternatively, you can enjoy swimming and revitalize yourself after the off-road experience. 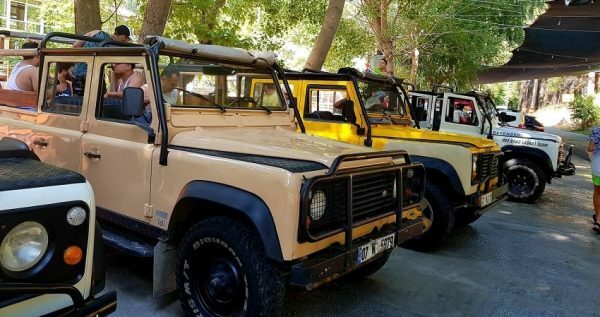 When the 45-minute break is over, the Jeeps will then continue on their way back to Selcuk. 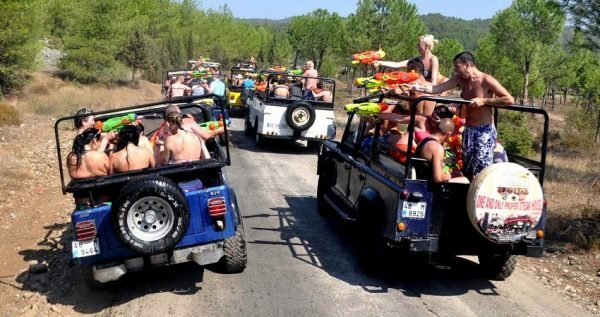 An interesting highlight is that participants can rent water guns and engage themselves in a fun and exciting water fighting between the Jeeps. Selcuk Jeep Safari adventure ends by the moment you arrive at your hotel. 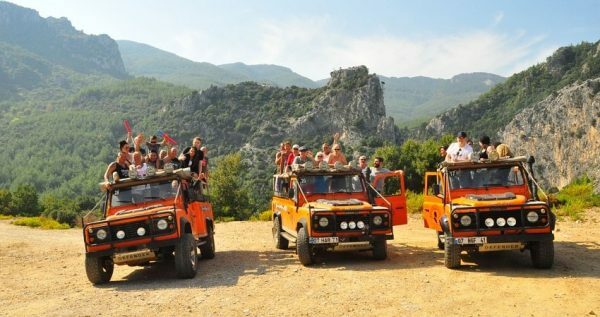 Full of emotions and adrenaline, this amazing off-road exploration of Kusadasi will be a great memory from your holidays.